Let's face it: vanilla can sometimes be so... vanilla. A great a-la-mode pairing should be as decadent as finding the perfect wine to go with your cheese plate. With A la Mode, IACP winners and cookbook dynamos Bruce Weinstein and Mark Scarbrough show you how to create innovative delights such as creamy hazelnut gelato atop coffee-poached pears, or maple frozen custard with a mouthwatering cinnamon roll cake, alongside simpler classics like confetti ice cream with layered vanilla birthday cake. You haven't lived until you've had peanut brittle pie with popcorn ice cream, a Cracker Jack fantasy! Because what's a warm pie without ice cream? With A la Mode, you'll have to answer that question! 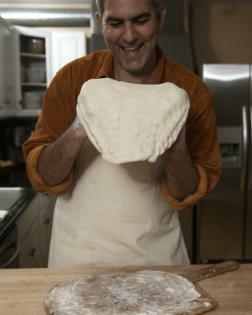 One of America's premier food experts, Bruce Weinstein's training began at Johnson and Wales Culinary Institute. He then worked as an advertising creative director specializing in food and drink clients such as Lea and Perrins, Bols, Bacardi, and José Cuervo. This culinary/creative expertise led to his first book, Frozen Drinks With or Without the Buzz (Clarkson Potter, 1997) . The Ultimate Ice Cream Book soon followed in 1999, published by Morrow, and has sold over 250,000 copies to date. The ice cream title was the impetus for his best-selling "ultimate" series that now includes The Ultimate Party Drink Book (2000) , The Ultimate Candy Book (2000) , The Ultimate Shrimp Book (2002) , The Ultimate Brownie Book (2002) , The Ultimate Potato Book (2003) , The Ultimate Muffin Book (2004) , The Ultimate Chocolate Cookie Book (2004) , The Ultimate Frozen Dessert Book (2005) , and The Ultimate Peanut Butter Book (2005) . In March, 2007, HarperCollins brought out his magnum opus: The Ultimate Cook Book: 900 New Recipes, Thousands of Ideas. Chosen as a main selection of the Book of the Month Club this title has been touted by the likes of Jacques Pepin and Bette Midler. January 2009 saw the publication of Pizza: Grill It, Bake It, Love It, followed by Cooking Know-How, a technique driven cookbook by John Wiley in April, 2009. This book won the Gourmand International Cook Book award for best American cook book in the easy recipe category. Along the way, other titles include Cooking for Two (2004) , a new way to cook for American's burgeoning small households, as well as Grilling Essentials (2002) for the Cooking Club of America, The Stonewall Kitchen Cookbook (2001) , and Dr. Phil's Weight Loss Solution Cookbook (2004) . In 2010 Bruce will have three new books published. Stewart Tabori, and Chang will publish Ham: An Obsession With The Hind Quarter in March then publish Bruce's first knitting book, Knits Men Want, in April. In May Simon & Schuster will publish REAL FOOD HAS CURVES - a 7-step plan to get off processed food.